Important dates are hard to remember even for young people. Since my grandpa was diagnosed with Alzheimer’s recently it’s been even more of a problem for my grandparents to try and remember dates. I saw different birthday calendars floating around on pinterest and knew I could do one too. I decided I wanted to include anniversaries on the calendar as well since I know those are important to them too. So here it goes. . .
1. Decide what you want the board to say. 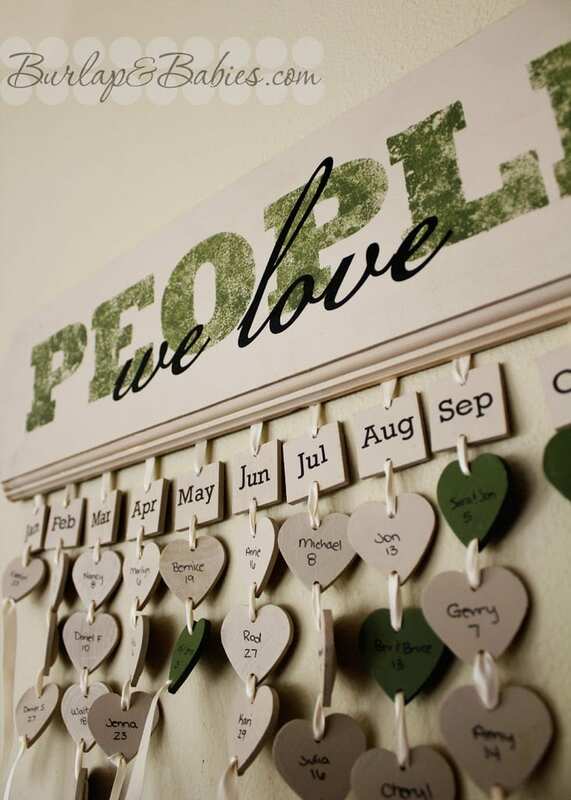 I chose “People We Love” or it could cleverly be “We Love People.” Some other options are important dates, specials days, birthdays, etc. I decided something general since I wanted to include anniversaries as well. 3. 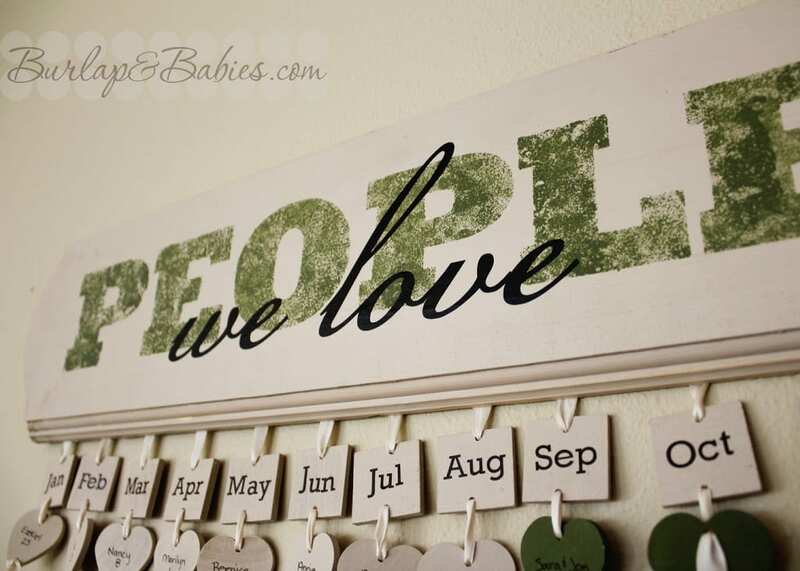 After taping the “people” stencil onto the dry board, I put paint on a paper plate and sponged the green paint onto the board. After “people” dried, I placed “we love” over the top of “people” in the middle of the board. 4. While I was working on the board, mr g started drilling two holes in each small wood piece. I used twelve squares, one for each month, and enough hearts for each family members birthday and anniversary. After the holes were drilled I proceeded to paint all of them: birthdays cream and anniversaries green. This was a big waiting game process to let paint dry and so this project took about a week but it was so worth it. 5. After the wood pieces dried, I put the month names on the squares using vinyl I cut using my Cameo and hand wrote names and dates on the others while keeping each pile of wood pieces divided by month. 6. Next, I took the cream ribbon and using my yarn needle strung each months pieces on starting with the square month name. Once all the pieces were put on ribbon by month I tied off the end and evenly spaced them on the back of my board before using the handy staple gun to attach them to the board. 7. The last step is to decide how you want to hang your final project. I decided to attach two jawtooth picture hangers to the back of the board since the final product was pretty heavy. 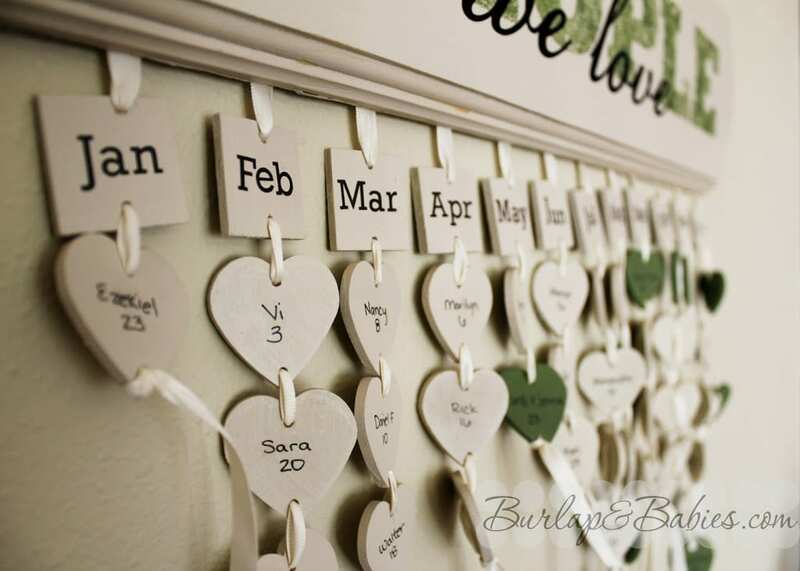 Do you have a creative way on how you remember birthdays and families anniversaries? 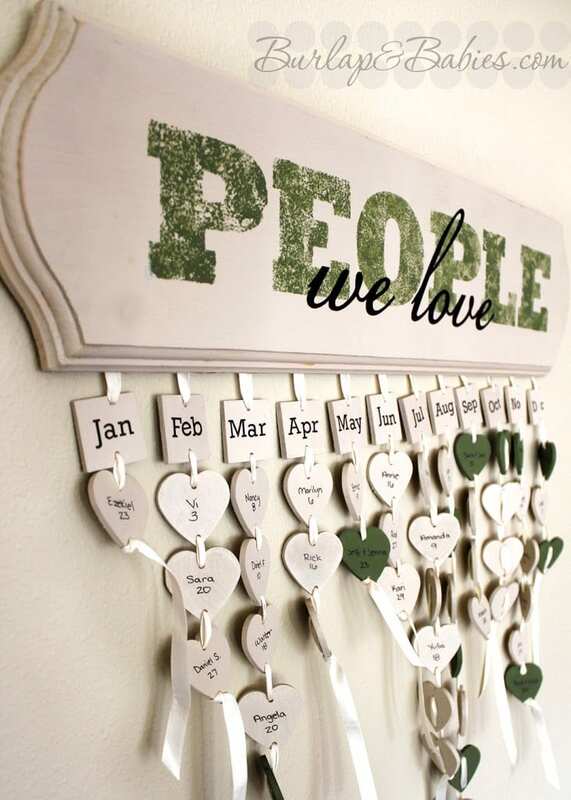 You know I really need something like this out in the open so I won’t forget bdays. And it’s cute!! Visiting from Retro Pin Party…pinning it! Do you know the names of the fonts you used? It is a cute project!